A (false) 'form' Sitchin invented and you promulgate. See what's happening here, folks? Creighton is using an invented character of forgery as a support pillar for a suspected forgery. Of course you would. Given the penchant to skew logic. But that's not the worst of it. Your example image trying to show how it all could have transpired step-by-step is as loosely conveyed as a science project of a five-year-old. 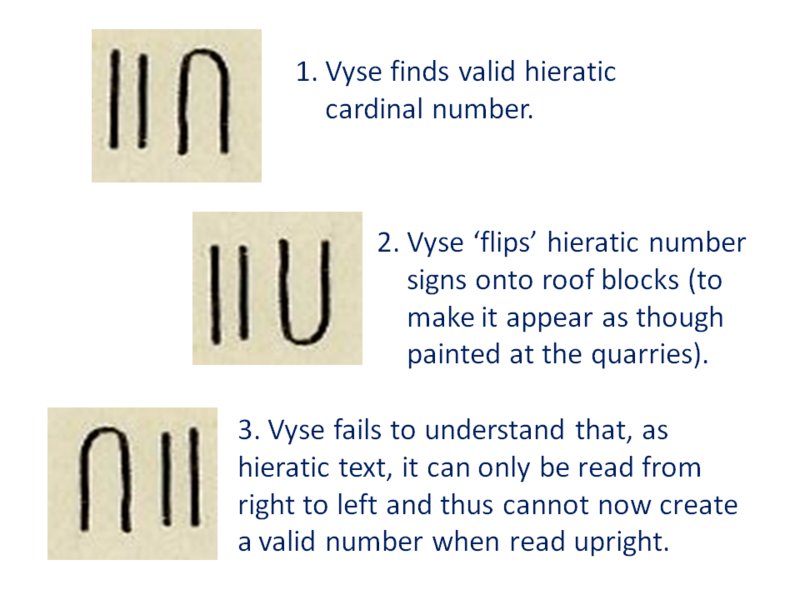 The orientation of the numerals has nothing to do with deciding if they are genuine, rather you are inventing (out of a mysterious existentialist vortex of space/time continuum) an 'additional' forgery scenario because you're obsessed with an initial cartouche forgery. Perhaps you were cornered by the need to explain all the other cartouche marks had to be faked too, and recognizing such a lost cause went after the 'rotation' forgery theory. Which is funny (not peculiarly) that noting so shoots you in the foot. Hasn't the 'convention' been shown 'unconventional' in both the above image and in the calendar relief Martin posted? What is the most beguiling in all this is that a mark or set of marks on a stone have no requirement to be in any particular orientation. Like if a tag for an i-beam on a construction site had '31259' on it, does it matter how the numbers are oriented?